PLEASE NOTE: The Afex™ Incontinence Management System is required to use this product! If you are recovering from Prostate surgery, experience frequent urination or other urological problems associated with male incontinence, Afex™ has developed the best solution for you! The Afex Incontinence Management System completely eliminates the need for external catheters and protects against skin breakdown. With Afex™, you can enjoy all the fun activities you participated in prior to incontinence. This system allows you to continue to fish, golf, bowl, etc. comfortably and worry free. The Afex™ Receptacles is an essential part of the Afex Incontinence Management System. It eliminates the need for adhesives and external condom catheters by offering a new, more comfortable way to wear incontinence protection. The double-wall design with drain holes elevates the skin, keeping it away from urine residue and backflow. The one-size-fits all innovative design is available in two styles: High Style with Flexi-Top and Low Style. The High Style w/Flexi-Top is best for users who stand for long periods of time and engages in high level activities. It's also recommended for night time use. The Low Style offers comfort and support for users who sit for long periods of time. To prevent infection and irritation, and to maintain healthy hygiene, Afex™ recommends cleaning the Receptacle daily with the Afex™ Cleaning Solution and the convenient Afex™ Cleansing Container with built-in drain holes. The Afex™ Cleaning Solution is specially formulated to safely clean and deodorize all of the Afex™ Incontinence Management System's components. 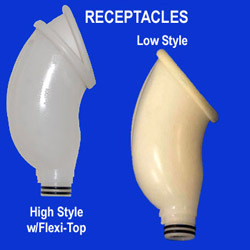 The Afex™ Cleansing Container holds one Afex™ Receptacle at a time and is a great place to store it when not in use. To use any of the Afex™ incontinence components, you must start with the Afex™ Incontinence Management System's Starter Pack (pictured on the right). It includes every thing you'll need: a Receptacle, a Collection Bag, a pair of the Long Boxer Briefs, a Cleaning Container and the Cleaning Solution. It also includes an instructional video to demonstrate proper use and care. An easy, convenient way to clean the Afex Receptacle. 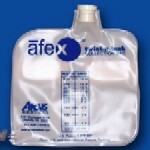 The Afex Collection Bag attaches to the Afex Receptable easily eliminating the needs for tubes or straps. 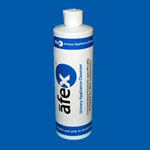 Cleansing solution recommended by Afex™ and specially formulated to safely clean all Afex™ incontinence components.